How to be the first to see fresh ads on used cars and know about price drop? If you decided to buy car quickly and profitable - fresh ads are correct choice in such situation. New ads appear very often on many sites, for example: autotrader.co.uk, autovillage.co.uk and others. In order to not to spend time on monitoring of such ads on sites, it is very easy to track them with Otsledit. 1.Can track at the same time 10 or more sites. 2.Immediate notifications when number of cars is changing in selected category. 3.Can choose specific makes and models and track only them. 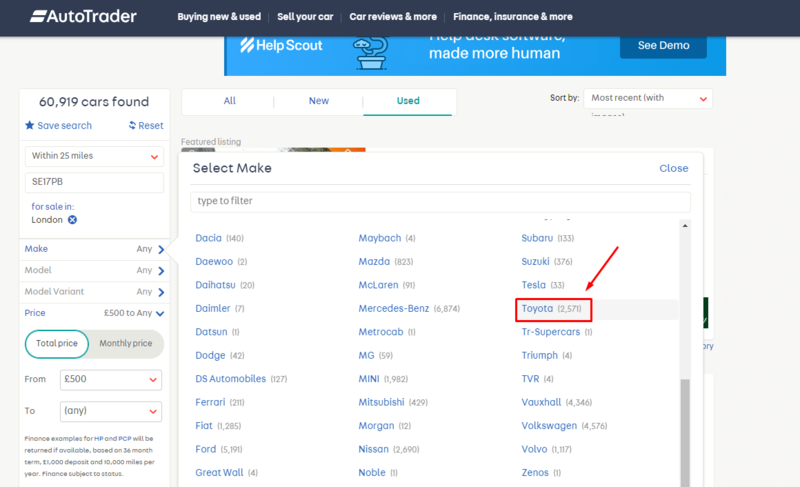 5.Can track the price, reviews and description of specific car to see the price drop on it. Track new ads about car sales with specific make and model. For example, you want to buy Toyota RAV-4. Look the used cars on autotrader.co.uk - fresh ads appear very often here. 1.Settle the expansion in any browser, click only the button and on main page of Otsledit. 2.Select desired category (or filter) on site and go to it. 3.Push the icon Otsledit in the upper right corner of your browser and click the button “ create track” ( as indicated by arrows on picture). 4.Highlight required numbers, place the cursor on number until green field will appear. In our case we want to track changes in number of cars Toyota RAV-4 (number 209 is highlighted on picture). It is mean when number of ads will change, we will get the notification and go to view new ads. 5.Name and change options if necessary, check the number of changes if track was added and number of cars was changed. 6.Get the notifications in such a view when browser is running. Track specific options of selected car, for example, change in price, views, appearance of new photos, change in description. You need to select several options on page. How to do it? 1.Need to make first steps as when tracking new ads. Next we need to add new options on page when pushing the button “+” (as shown by arrow on picture). 2.After selection of required options need to end selection and push check mark (look at picture). 3.In order to see what track and options of car you are looking, go to view of tracks. 4.Change and check options which are you tracking. We can see at picture that we add for tracking the price, rating of car, headline. On autotrader.co.uk new ads appear every day. The same action you can do on this platform. So, the expansion will help to learn first reduced price on used cars and change of contacts, number of owners, mileage, updated comments, reviews of buyers and other information. All new ads about car sales, changes in price now will update in comfortable for analysis format in one place!